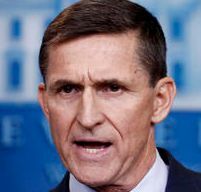 Michael Flynn is a retired U.S. Army lieutenant general and former head of the Pentagon’s Defense Intelligence Agency. Three fact-checking takeaways from Comey's testimony and reaction to it. Michael Flynn's brief stint in the White House as Donald Trump's national security adviser has created headache after headache for the new administration. Here's a list of what he did, and when, based on reports. As fact-checkers, we took special notice of Gen. Michael Flynn's taste for fake news and conspiracy theories — a trait that seems incongruous with a high-ranking intelligence role. The retired lieutenant general made the claim in a speech at a temple in August and CNN publicized it Nov. 22.